As the summer progresses, my mum has been (not so subtly) hinting at me making some sweet things, so I thought I'd bake a beautiful summer crisp; grilled peaches with a sprinkling of cinnamon brown sugar, topped with a oat & pecan crisp, with chewy pieces of dried apricot, all served up with some home-made vanilla whiskey fro-yo. This recipe is the perfect example of where there are countless opportunities to pile up the calories with cups of sugar and butter, but in this version, I cut all that out without compromising on flavour and only used 6 ingredients! If you want you can substitute the brown sugar with another sweetener, like maple syrup - I used what I have on hand, just like the whiskey and the majority of the other ingredients! 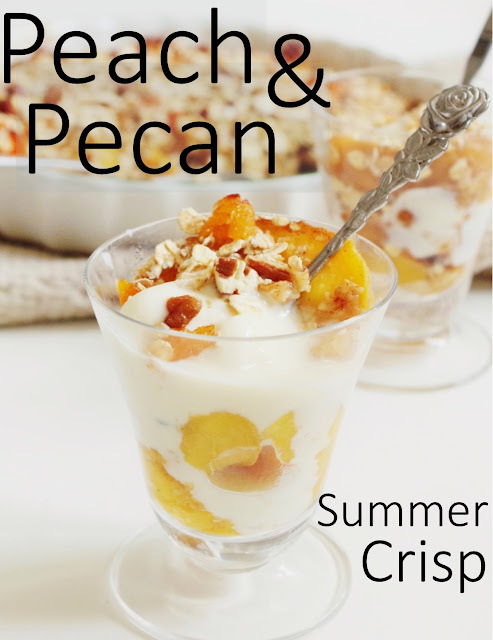 The perfect peaches to use for this recipe are ones that are slightly soft to the touch but aren't over-ripe, the heat from grilling and baking will soften them up and the release the juices but they'll still hold together for serving. The smell of fresh summer peaches grilling is absolutely amazing, as the sugars caramelize the most delightful aroma fills the house, the smells foods release whilst cooking are definitely one of the many perks of cooking from scratch! I served mine up with some frozen vanilla yogurt that I mixed with whiskey and placed in my ice cream churner, but you can serve up with any dairy free ice cream/yogurt. If you do decide to make your own ice cream, use around 10% alcohol compared to the volume of liquid you have, e.g. if using 500ml of yogurt, add 50ml of alcohol to keep it from freezing completely solid later. This recipe really couldn't be any simpler and is great to serve up with company as a dessert, but would even work as a breakfast dish (minus the whiskey ice cream!). Cut the peaches in half, remove the stones, then cut each half into 4, place onto a griddle pan on a high heat and grill each side for 3-4 minutes, then immediately place into the baking dish as the juice will start to escape. Meanwhile, chop the apricots into small pieces, roughly chop the pecans and mix into the oats, then mix the cinnamon and sugar together in a dish. Sprinkle half of the cinnamon sugar on top of peaches. then evenly spread out the oat mixture on top and sprinkle over the rest of the sugar. Place in the oven for 12-15 minutes, until golden brown. Serve warm with vanilla ice cream and enjoy!